The Hyundai 3.3L V6 gasoline engine (G6DB, G6DF, G6DH and G6DP) is a member of the Lambda family. The first Hyundai’s 3.3-liter engine of that series was introduced in the 2006 Hyundai Sonata. It was the G6DB – 3.3L V6 MPI engine. In 2010, the upgraded Lambda II version became the replacement for the G6DB, and later, laid in a basis of the direct injected engine and its turbocharged version. Let's take a closer look at each evolutionary step of the Hyundai 3.3L engine. The 3.3L MPI Lambda engine is built around an aluminum open-deck type engine block. There are lightweight aluminum cylinder heads with four valves per cylinder and two overhead camshafts for each cylinder bank. Lambda engines use two timing chains (by one for each head) and variable valve timing (Hyundai’s CVVT) on the intake side only. The valves are actuated via solid buckets (there are not hydraulic cam followers). In this case, the adjustment is required every 60,000 miles (100,000 km). Cylinder heads are covered by aluminum head covers. The G6DB engine is equipped with the multi-port fuel injection system. The fuel system delivers fuel for combustion using a conventional way of spraying it by nozzles (injectors) into intake ports before the intake valves. The intake manifold is made from plastic for weight savings. The throttle body is already electronic - the accelerator pedal is electronically connected to the throttle valve. The G6DF or 3.3L MPI Lambda II engine appeared in 2009. Slightly improvements over its predecessor allowed G6DF engine increase maximum output performance and at the same time to be more environmentally friendly. The Lambda II MPI series has Dual CVVT – variable intake and exhaust valve timing. Visually, it is easy to distinguish this series with a new timing chain cover and plastic cylinder head covers. The GDI version of 3.3 Lambda II engine (the G6DH) is produced since 2011. The new engine got a redesigned lightweight crankshaft with optimized balancing weights and a chain-driven variable displacement oil pump. The new cylinder heads still have 4 valves per cylinder (two intake valves and two exhaust valves) and no hydraulic cam followers, chain-driven double overhead camshafts with Dual CVVT system, but also new holes and mounting points for the high-pressure direct fuel injectors. The engine is equipped with one high-pressure pump which mounted on top of one cylinder head (the front head of transverse engines or the right cylinder head of longitudinal engines). The fuel pump is actuated by an additional cam on the exhaust camshaft and provides the max pressure up to 150 Bar. The electronically controlled direct injectors spray compressed fuel into the combustion chambers directly for the more precisely controlled and efficient combustion process. 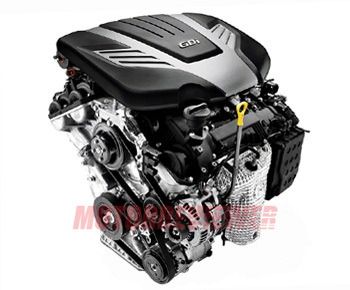 Due to the high power, the 3.3 GDI engines are installed on large SUVs and crossovers of the Korean manufacturer and also in the cars of the luxury brand Genesis. The most powerful and advanced version is the 3.3L T-GDI Lambda II engine (labeled as G6DP). The G6DP is an all-aluminum 3.3-liter V6 direct-injected twin-turbo engine firstly used in 2016 Genesis G80 and, a year later, in the Kia Stinger. The engine received new cylinder heads with the integrated and water-cooled exhaust manifold. The engineers installed exhaust valves with a sodium-filled stem and head. Water jackets of new heads have increased volume for better cooling. The cooling system now is equipped with an electronically controlled thermostat for precise engine temperature control. Like the G6DH, the turbo engine has the high-pressure direct-injection system (GDI), but the new system functions at 200 bar (2,900 psi) of max-pressure due to increased fuel demand. A boost air comes from two single-scroll turbochargers (by one for each cylinder bank) equipped with electronic wastegate actuators. Hot compressed air at first goes through the air-to-air intercooler and then into an aluminum intake manifold. Turbochargers operate in connection with the new Dual CVVT system, which provides up of 85º of phasing compare to 50º of cam phasing inside the previous Lambda engines. 5W-20 – GDI and T-GDI engines. 6.9 (7.29 qt) – T-GDI version. Most problems for 3.3L MPI engines are related to high oil consumption. This is typical for engines with above-average mileage, which more likely have stuck/seized piston rings. The problem with the oil system can cause serious damages. It’s recommended to change the oil in time follow the maintenance schedule and sometimes even more frequently. Fresh high-quality engine oil also prolongs the life of cam followers and can increase intervals between valve clearance adjustments. The average engine life for 3.3 MPI Lambda and Lambda II is about 180,000 miles (300,000 km). The 3.3L GDI engine has, in addition, a problem with carbon build-up on the intake valves. This is very common for direct injected engines. High oil consumption is also more pronounced. It’s all reduced reliability and dropped longevity down to 150,000 miles (250,000 km). Engineers didn’t apply the carbon build-up solution for the twin-turbo 3.3 T-GDI – combined port and direct injection system, the way it was used in Toyota’s 2GR-FKS engine, for example. So, this problem is still there. Turbochargers also don’t add reliability. The engine is relatively new and there is not enough data yet, but it is hard to believe in that the turbocharged versions will last as long as naturally aspirated 3.3L GDI engines. G6DB - 235 hp (175 kW) at 6,000 rpm, 226 ft-lb (306 Nm) at 3,500 rpm. Compression ratio is 10.4:1. This is the first 3.3L MPI Lambda engine. Application: Hyundai Azera, Hyundai Santa Fe, Hyundai Sonata, Kia Sorento. G6DF - 262-270 hp (195-201 kW) at 6,200 rpm, 233-235 ft-lb (316-319 Nm) at 4,500 rpm. The 3.3L MPI Lambda II engine is for the Hyundai Azera, Hyundai Sonata. G6DH - 280-294 hp (209-219 kW) at 6,400 rpm, 248-255 ft-lb (336-346 Nm) at 5,300 rpm. The G6DH is a 3.3L GDI Lambda II engine. CR is 11.5:1. Application: Hyundai Palisade, Hyundai Azera, Hyundai Santa Fe, Kia Sedona, Kia Cadenza, Kia Sorento. G6DP - 365 hp (272 kW) at 6,000 rpm, 376 ft-lb (510 Nm) at 1,300-4,500 rpm. This is the twin-turbo 3.3L T-GDI engine available for the Kia Stinger, Genesis G70, Genesis G80, and Genesis G90.